Here's a story that is a bit hard to believe, and I don't hold too much credence to it. Could the Google Chromebook be challenging the mighty Microsoft for dominance in the sector? 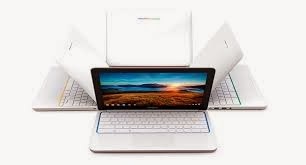 Hopefully not, as there isn't too many things one can do with a Chromebook laptop but it does have 2 good things going for it for average consumers that like to surf the web and send emails. It's simple, it's fast, and it works well. Was that 3 good things? But wait there's more... If you don't mind, you can pay quite a bit less for that privilege on the web as well. Call it a glorified tablet, but the Chromebook has no where to go but up.